Planning a trip to Bali, but not quite sure where to go on Indonesia’s most well-known island? With so many gorgeous places to visit in Bali, often referred to as ‘the Island of the Gods’, it’s easy to be unsure of where to visit, and what to see and do. Here are our recommendations for the top 10 places to visit in Bali (in no particular order) that simply cannot be missed. The Money Forest is where you can have close encounters with these playful macaques. Enjoy a peaceful stroll through the green forest. This nature reserve is a monkey lover’s paradise! 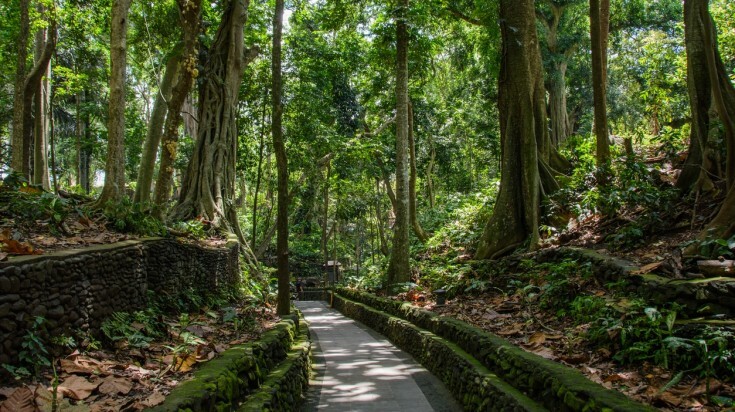 Home to over 600 crab-eating macaque monkeys, along with various Hindu temples, Ubud Monkey Forest is one of Bali’s most popular attractions, visited by over 10,000 tourists each month. The nature reserve was established with a mission to create peace and harmony for its visitors while also conserving rare plants and maintaining a natural habitat for its monkeys. Best time to visit: Visit in the early afternoon, around 2:00 pm, as the monkeys have normally been fed by this time and are less assertive. Tip: Keep an eye on your bags and small children, and don’t bring in snacks — the monkeys are known to get a little too playful. Certainly Bali’s most well-known temple and perhaps one of its most signature landmarks, Tanah Lot, or Pura Tanah Lot, is a truly unique site. Sitting atop a rock (from which the temple gets its name), this historic Hindu monument is surrounded by crashing sea waves. It is one of seven sea temples along the Balinese coast. Tip: Visitors aren’t allowed on the temple grounds but you can walk around the temple. Chose to hike Mount Batur in wee hours of the morning to catch an exquisite scarlet sunrise. 1,717 m is the highest point of the hike. 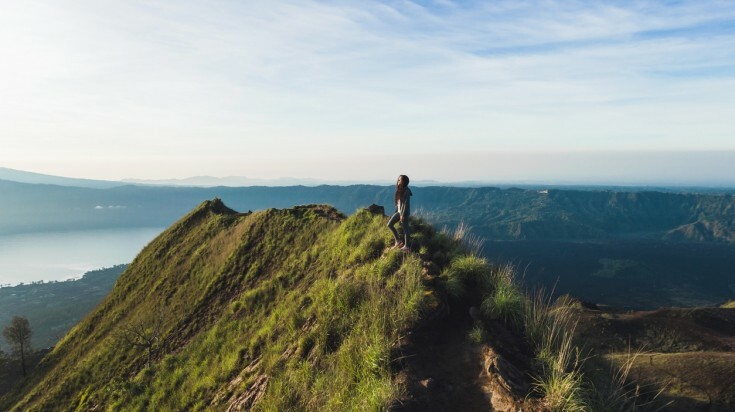 If you’re wondering where to go in Bali to see some of the island’s most beautiful natural sites, the active volcano Mount Batur should definitely top your list. Many tour companies offer hikes of Mount Batur, which can be completed in about two hours. Best time to visit: Many tours offer sunrise hikes of Mount Batur, giving you an unforgettable view of Bali’s scenery as daylight breaks. Tips: Although Bali is a tropical destination, temperatures can drop at the top of Mount Batur, so make sure to bring some warm clothes. Visit over 60 different species of animals from the safety and comfort of a safari bus at the Bali Safari and Marine Park as they roam about. Get up close and personal with zebras, orangutans and elephants before dropping by the aquarium to watch sharks lurking in the waters. Spend a night in the park’s hotel for panoramic views of the animals. Best time to visit: Year round, but visit in the spring for some baby animals! Tips: The park has numerous shows and parades, so make sure to check up on the park’s schedule for the day. 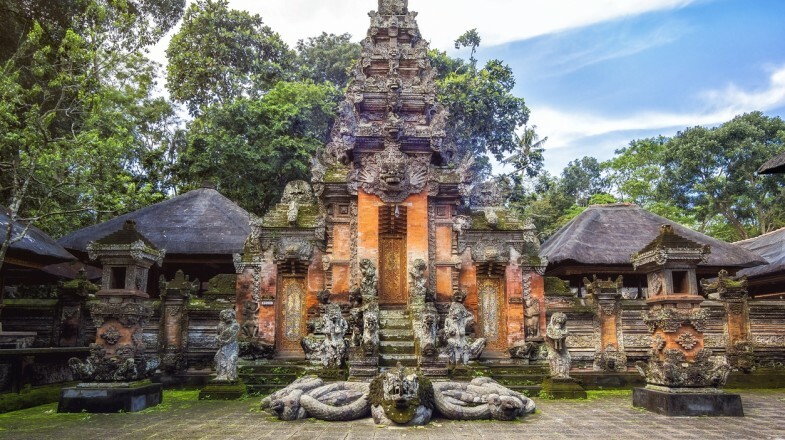 The Besakih Temple is also known as the "Mother temple of Bali". 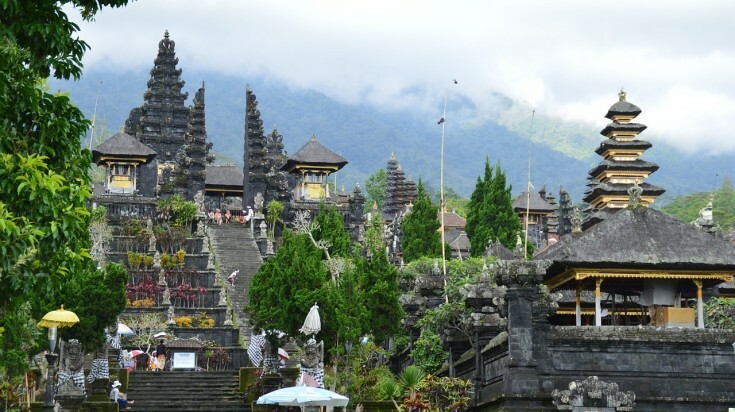 Also known as the ‘mother temple’ of Bali, Besakih Temple can be found an impressive 1000 metres high, along the side of Mount Agung, Bali’s highest volcano mountain. The temple complex is actually made up of 23 temples waiting to be explored - though the most iconic is certainly Pura Penataran Agung with its six-terraced levels. 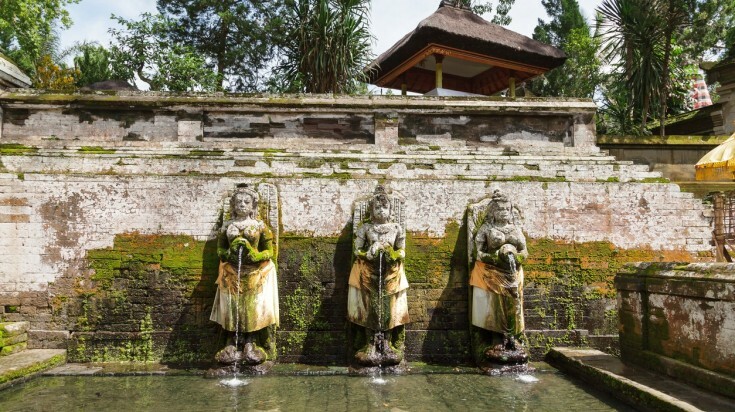 Best time to visit: The Besakih Temple complex’s main temple holds a festival once every 210 days. This wonderful spectacle shouldn’t be missed, and will next take place on 20 March, 2019. Tip: Make sure to dress modestly as revealing attire is prohibited inside Indonesian temples. The ancient bathing pool at Goa Gajah. 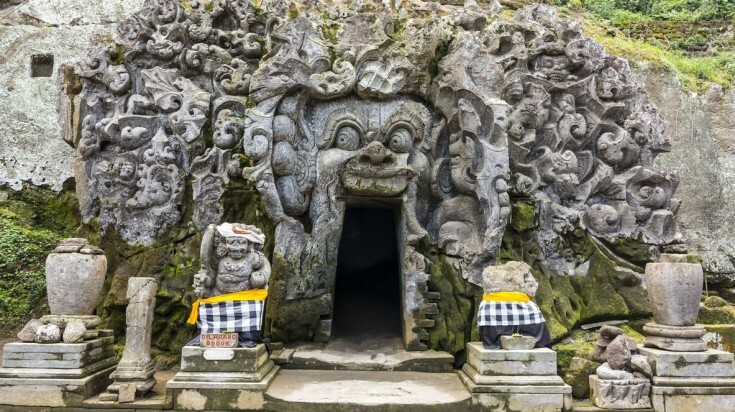 Goa Gajah, or ‘Elephant Cave’, is a former sanctuary that dates all the way back to the 9th century. To visit the cave, you must enter through the mouth of a demon that has been carved into the facade. Inside, you’ll find fragments of Hindu statues, including Ganesha, a god with an elephant head that gives the cave its name. Outside, you’ll also be able to see some ancient bathing pools. Tip: Similar to the Besakih temple, make sure to dress modestly. The temple also provides sarongs for hire. If you’re looking for places to find adventure in Bali, Kuta Beach, one of the best beaches to visit in Bali certainly won’t disappoint. 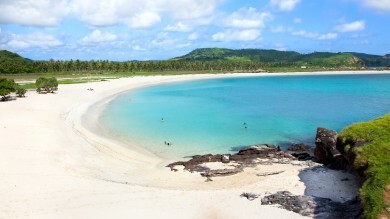 By day, the white sandy beach is the perfect spot for surfing and sunbathing. By night, it becomes one of the island’s most active nightlife scenes. If you’re looking for more peace and quiet, you can also find it at the north end of the beach. Tip: Kuta is a popular tourist beach but this also means that there are lots of tourist scammers around. So stay alert. Visit the Uluwatu temple during sunset. Uluwatu Temple is loosely translated into English as “something divine at the end of the land”, and that sums it up perfectly. 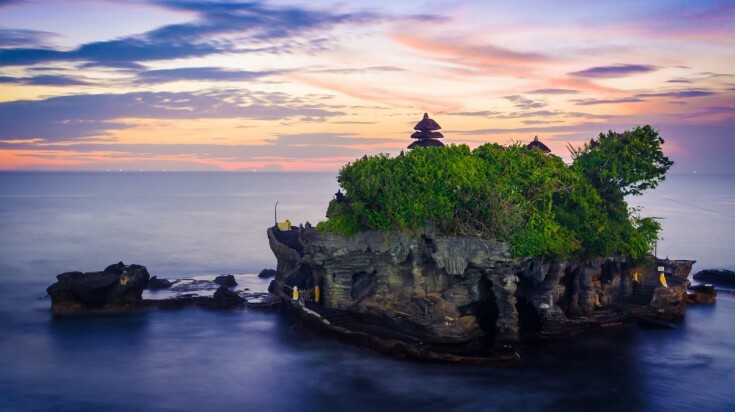 This sight is another of Bali’s stunning sea temples, hanging from the very edge of a 70-meter-high cliff jutting out into the sea. 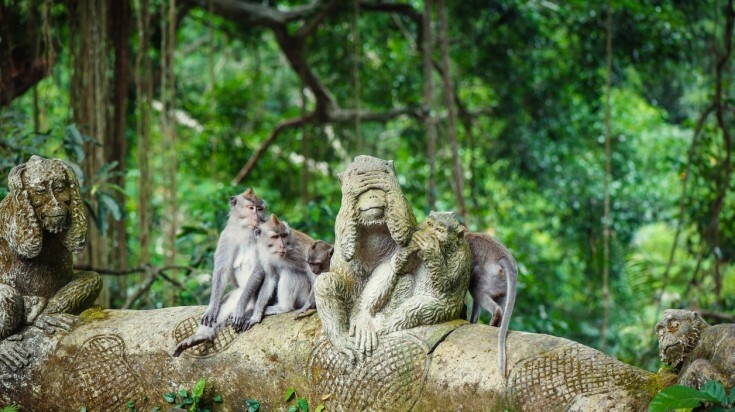 Not only does the temple offer incredible views off Bali’s coast, it is also home to Macaque monkeys. Be careful, though - these monkeys are known to steal the personal belongings of tourists visiting the temple! Tip: Monkeys in the temple are known to steal attractive items like sunglasses and phones so make sure to keep these items away from sight. The rice terraces in Bali are a perfect spot for scenic photographs. No visit to Bali is complete without a visit to one of its many rice paddy fields. 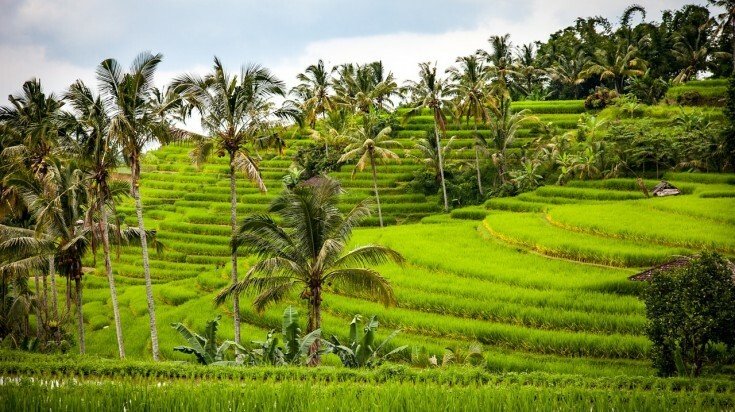 Learn more about subak, a traditional Balinese irrigation system, and be sure to bring your camera along to take scenic photos of the lush, green terraces. 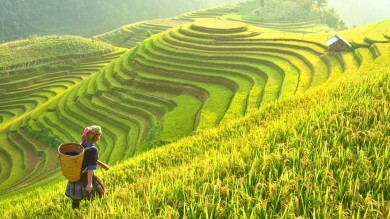 Tip: There are several hiking trails that you can take around the Rice Terraces. Relax on the beautiful beaches of Menjangan island. Though off the coast of Bali island, Menjangan is part of the West Bali National Park. This picture-perfect island is known for its crystal-clear waters and white sandy beaches, and is the perfect location for a bit of snorkeling or scuba-diving! If you’re lucky, you may even catch a glimpse of a sea turtle or manta ray! Even more likely is a sighting of one of the majestic sambar deer that call the island home. 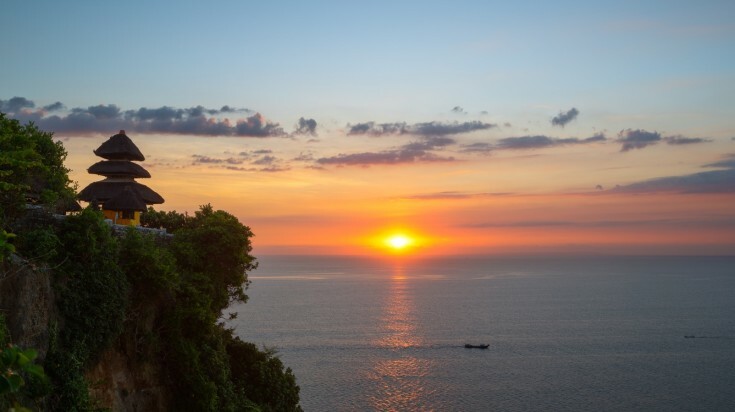 Tip: Visit the Bali tower for spectacular views of the sunset and the West Bali National Park. 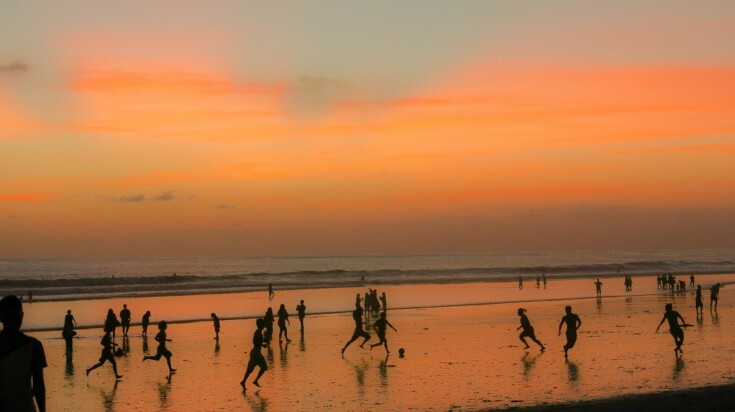 Check out our travel guide on Top things to do on Bali. If you're looking to rent a villa on Bali, check out Villa Bali.